Home » Blog » Is Oxalate Sensitivity Real? ding a variety of leafy greens (beet greens, spinach, chard, endive, dandelion greens, kale, purslane, watercress, turnip greens, and collard greens! ), most berries, most nuts, tea (made from real tea leaves), sweet potatoes, white potatoes, chives, parsley, broccoli, cabbage, okra, chocolate, beet root, cassava, carrots, and rhubarb. For the average American, three foods alone—spinach, potatoes, and nuts—make up 44% of our total oxalate intake! Unfortunately, many people have been scared away from eating high-oxalate foods due to concerns about oxalate sensitivity. Although there’s no official medical definition for oxalate sensitivity, it typically refers to a tendency to develop kidney stones and/or muscle and joint pain as a result of eating high-oxalate foods. When the concentration of oxalates and calcium in the urine becomes too high to dilute (a condition called hyperoxaluria), calcium oxalate crystals can form in the kidneys and develop into stones (although there are different types of kidney stones, calcium-oxalate kidney stones are the most common, accounting for about 80% of cases!). When oxalate levels are too high in the blood (a condition called oxalosis), oxalate crystals can build up in the joints, muscles, and other tissues, leading to oxalate arthritis. To be clear, hyperoxularia and oxalosis are legitimate conditions—there’s no controversy there. Some people (about one in three million) have genetic disorders that cause too much oxalate to be produced within the body, and other people have absorption disorders that cause too much oxalate to get absorbed from the gut (including Crohn’s disease, celiac disease, chronic pancreatitis, and side-effects from bariatric surgery). The question is whether high-oxalate foods are to blame for the symptoms that result, and whether cutting those foods out of our diet is really the best plan of action. And, the answers aren’t so simple! Part of the problem with avoiding high-oxalate foods in order to treat “oxalate sensitivity” is that the oxalate we eat doesn’t automatically become oxalate in our blood and urine. How could this be? There are a few explanations! Under normal circumstances, the body has mechanisms to maintain oxalate homeostasis regardless of how much oxalate we ingest. In the gut, the bacteria Oxalobacter formigenes (as well as some lactobacilli and bifidobacteria strains, particularly Bifidobacterium animalis subsp. lactis) degrades oxalate from the foods we eat, and helps regulate how much dietary oxalate makes it into our system. And on top of reducing absorption, O. formigenes also stimulates the intestinal epithelium to secrete oxalate that’s already within our bodies, which helps reduce our total oxalate load even further! Research shows that people with oxalate-degrading bacteria in their guts have significantly lower risk of developing kidney stones, even on high-oxalate diets (for example, people colonized with O. formigenes have a 70% lower risk of being recurrent kidney stone formers). And, studies have also demonstrated that consuming oxalate-degrading bacteria (such lactic acid bacteria including B. infantis, L. plantarum, and L. brevis) reduces oxalate levels in urine, meaning that certain probiotics could help combat kidney stones and other problems associated with high oxalate levels. Dehydration is a major cause of high urinary oxalate and kidney stone development. Increasing fluid intake (hydrating ourselves better!) reduces the risk of kidney stones by increasing urine volume and diluting calcium and oxalate levels, in turn helping prevent stones from forming. In fact, ingesting enough fluids (whether through drinking beverages or eating high-water-volume foods like vegetables and fruit) to keep urine flow greater than 1 ml/kg/h nearly eliminates the risk of oxalate oversaturation in the urine, and can dramatically reduce kidney stone formation! Although calcium supplements have been positively associated with kidney stones, too little dietary calcium can also increase our risk of kidney stones. That’s because dietary calcium reduces how much oxalate we absorb, leading to lower oxalate levels in the urine (so when we consume inadequate calcium, oxalate levels can concurrently rise). The key here is to avoid both extremely high and extremely low intakes of calcium, sticking instead to diverse nutrient-dense foods that supply healthy amounts of this mineral (think: bone-in fish like sardines, dark leafy greens, broccoli, and high-quality dairy for those who tolerate it). Citric acid, found at high concentrations in citrus fruits (especially lemons and limes), has been shown to protect against kidney stones by binding with urinary calcium (which helps prevent urine from becoming oversaturated with calcium) and by binding with calcium oxalate crystals (which prevents the crystals from growing in size and becoming stones). Consuming 4 oz. of lemon juice per day is enough to increase levels of urinary citrate (citrates are citric acid salts) and reduce kidney stone risk. Cranberry juice appears to have a similar kidney stone-reducing properties, by reducing both oxalate and calcium levels in the urine while boosting urinary citrate levels. Because of its conversion to oxalate in the body, vitamin C intake can influence oxalate levels in our urine, and—at high intakes—potentially contribute to stones. Although there’s no need to stop eating whole-food, nutrient-dense sources of vitamin C (like citrus fruit and other fresh produce), people prone to kidney stones could benefit from avoiding vitamin C supplements. 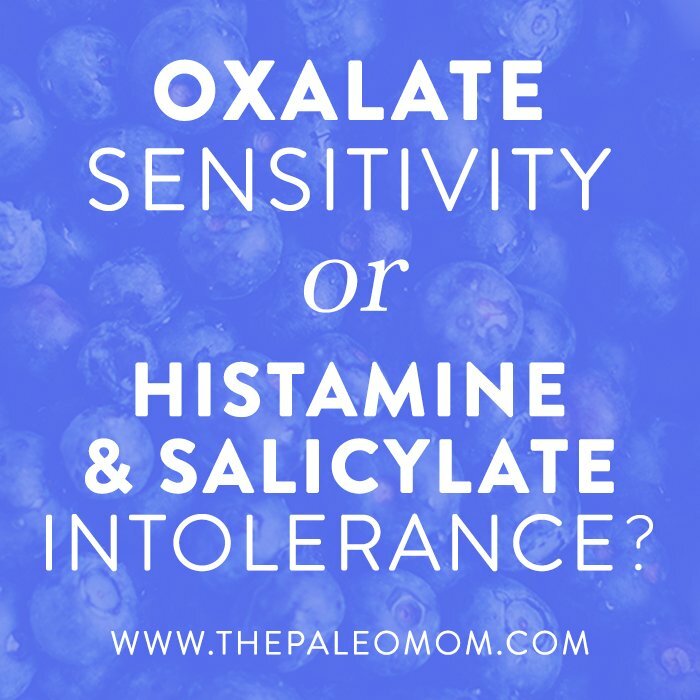 Oxalate Sensitivity… or Histamine and Salicylate Intolerance? Oxalate sensitivity is frequently self-diagnosed based on observed symptoms when eating high-oxalate foods. However, most of the time, this is probably a case of mistaken identity! While it’s true that many people feel better after switching to a low-oxalate diet (at least anecdotally! 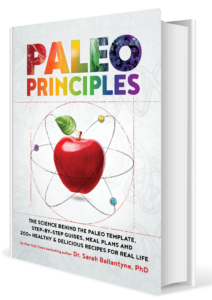 ), many high-oxalate foods are also rich in two other problematic compounds: histamine and salicylate (see “Teaser Excerpt from The Paleo Approach: Histamine Intolerance” and “What is Salicylate Sensitivity/Intolerance?”). In fact, some of the highest-oxalate foods are also high in histamine (spinach, strawberries, and tea), and the vast majority of high-oxalate foods are also high in salicylate, including: berries, broccoli, coffee, tea, sweet potatoes, beets, carrots white potatoes, spinach, carrots, and almonds! Because of the tremendous overlap between foods containing oxalate, histamine, and salicylate, it’s likely that some people who feel better eating a low-oxalate diet are actually improving because they’ve reduced their histamine and/or salicylate intake. 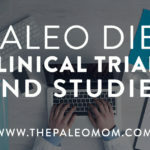 This is particularly true if the symptoms that clear up on a low-oxalate diet are unrelated to arthritis or kidney stones, which are the only issues credibly linked to oxalate (for example: headaches, itchy skin, hives, rashes, fatigue, nasal congestion, itchy or puffy eyes, hives, rashes, and other allergy-like symptoms are unrelated to oxalate, but definitely could result from histamine and salicylate intolerance!). So, “oxalate sensitivity” may be a case of mistaken identity in many instances. 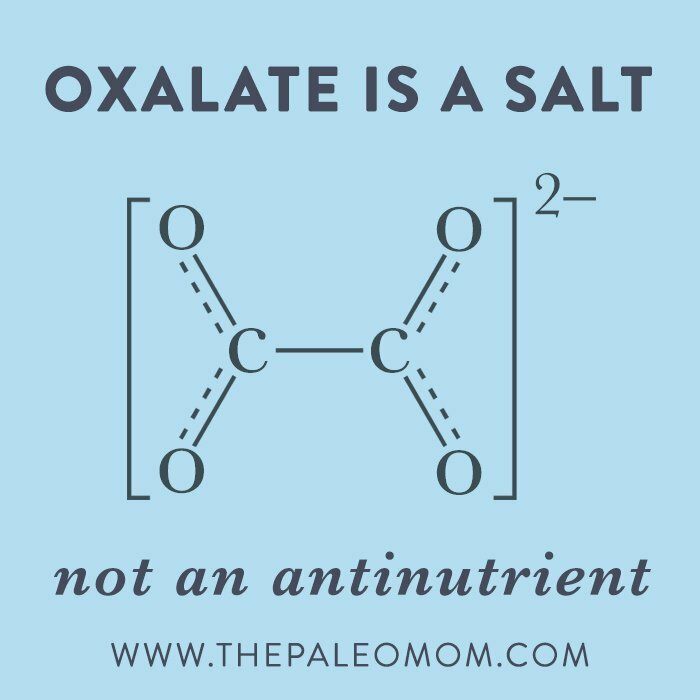 But Isn’t Oxalate an Antinutrient? Like phytate, oxalate is a salt, meaning that it’s a mineral (most notably calcium) bound with oxalic acid. There’s an erroneous myth that eating foods high in oxalates (or phytates) will deplete our bodies of important minerals, but this is simply not true. 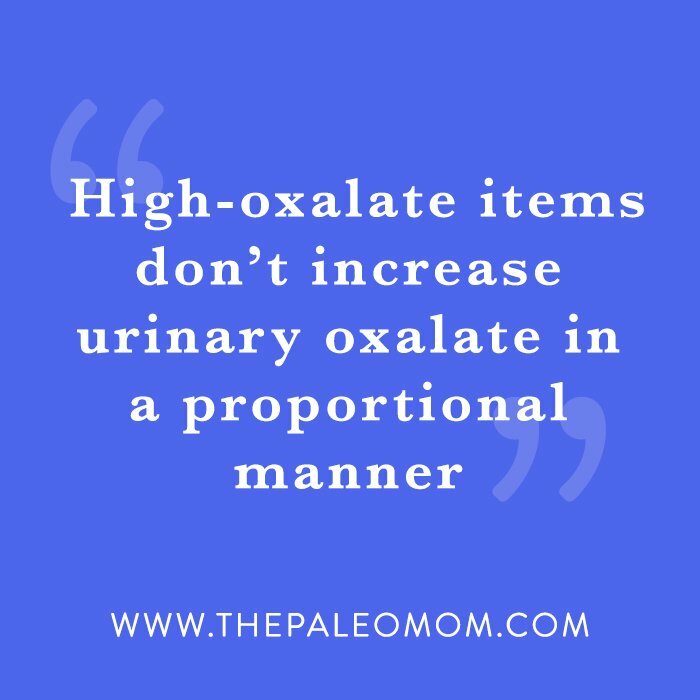 While oxalate (and phytate) make the minerals that it’s bound to within the food we eat more difficult to absorb (at least until they’re properly processed by our healthy gut bacteria), they do not leach minerals from our bodies. 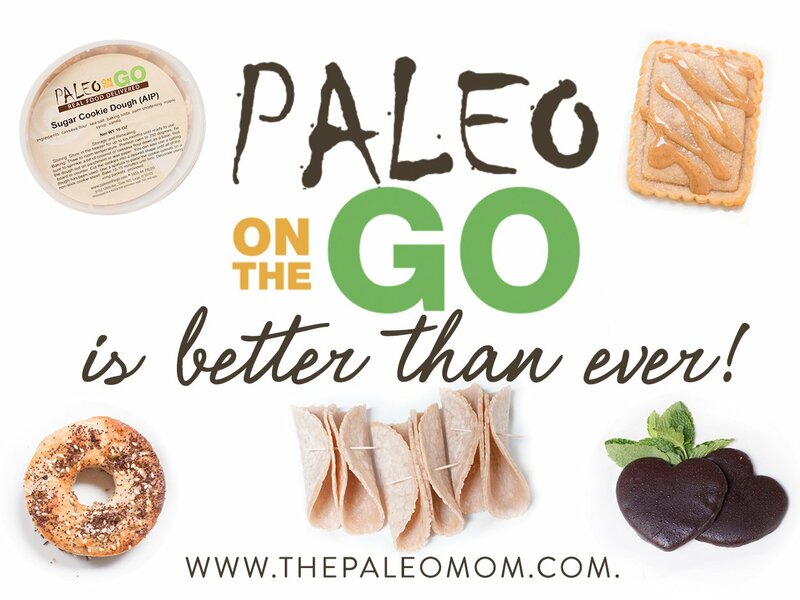 It’s also a myth that we can’t absorb any nutrition from foods rich in oxalates (or phytates); not only can our gut bacteria liberate the minerals from these antinutrients, these foods contain vitamins, fiber, phytochemicals and minerals that are not bound with oxalic or phytic acid which are all beneficial! Should We Avoid High-Oxalate Foods? So, should we limit our intake of high-oxalate foods in order to improve our health? For most of us, the answer is a resounding no! For people who have never developed kidney stones or oxalate-related muscle and joint pain, oxalate consumption is generally a non-issue. On the other hand, people with gut disorders (or other medical conditions) that increase oxalate absorption might initially benefit from cutting back on high-oxalate foods, but unless the condition is due to an unchangeable genetic defect, this is just putting a Band-Aid on the real problem. Rather than eliminating some of the most nutrient-dense foods on the planet, our focus should be on building a healthy gut microbiome that adequately degrades oxalate and prevents excess oxalate from getting absorbed (while also making an effort to stay fully hydrated, consuming sources of citric acid, and eating a diet with sufficient (but not excessive) calcium). These changes may (over time!) enable the small number of people with legitimate “oxalate sensitivity” to consume high-oxalate foods without negative consequences. Campier C, et al. “Reduction of oxaluria after an oral course of lactic acid bacteria at high concentration.” Kidney Int. 2001 Sep;60(3):1097-105. Chai W & Liebman M. “Assessment of oxalate absorption from almonds and black beans with and without the use of an extrinsic label.” J Urol. 2004 Sep;172(3):953-7. Dogliotti E, et al. “Nutrition in calcium nephrolithiasis.” J Transl Med. 2013;11:109. Ito Y, et al. “Preventive Effects of Green Tea on Renal Stone Formation and the Role of Oxidative Stress in Nephrolithiasis.” J Urol. 2005;173(1):271-275. Jeong BC, et al. “Effects of green tea on urinary stone formation: an in vivo and in vitro study.” J Endourol. 2006 May;20(5):356-61. Jiang J, et al. “Impact of dietary calcium and oxalate, and Oxalobacter formigenes colonization on urinary oxalate excretion.” J Urol. 2011 Jul;186(1):135-9. doi: 10.1016/j.juro.2011.03.006. Epub 2011 May 14. Johnri N, et al. “An update and practical guide to renal stone management.” Nephron Clin Pract. 2010;116(3):c159-71. doi: 10.1159/000317196. Epub 2010 Jul 2. Kaufman DW, et al. “Oxalobacter formigenes May Reduce the Risk of Calcium Oxalate Kidney Stones.” J Am Soc Nephrol. 2008 Jun; 19(6): 1197–1203. Klimesova K, et al. “Bifidobacterium animalis subsp. lactis decreases urinary oxalate excretion in a mouse model of primary hyperoxaluria.” Urolithiasis. 2015;43(2):107-117. Knight J, et al. “Ascorbic acid intake and oxalate synthesis.” Urolithiasis. 2016 Aug;44(4):289-97. Li X, et al. “Oxalobacter formigenes Colonization and Oxalate Dynamics in a Mouse Model.” Appl Environ Microbiol. 2015 Aug;81(15):5048-54. Lies JC, et al. “Use of a probiotic to decrease enteric hyperoxaluria.” Kidney Int. 2005 Sep;68(3):1244-9. Lorenz E, et al. “Update on Oxalate Crystal Disease.” Curr Rheumatol Rep. 2013 Jul; 15(7): 340. Luck A, et al. “Human serum transferrin: Is there a link between autism, high oxalate and iron deficiency anemia?” Biochemistry. 2013 Nov 19; 52(46): 10.1021/bi401190m. Massey LK, et al. “Effect of dietary oxalate and calcium on urinary oxalate and risk of formation of calcium oxalate kidney stones.” J Am Diet Assoc. 1993 Aug;93(8):901-6. Saxena A & Sharma RK. “Nutritional aspect of nephrolithiasis.” Indian J Urol. 2010 Oct;26(4):523-30. Seltzer MA, et al. “Dietary manipulation with lemonade to treat hypocitraturic calcium nephrolithiasis.” J Urol. 1996 Sep;156(3):907-9. Stewart CS, et al. “Oxalobacter formigenes and its role in oxalate metabolism in the human gut.” FEMS Microbiol Lett. 2004 Jan 15;230(1):1-7. Taylor EN & Curhan GC. “Determinants of 24-hour Urinary Oxalate Excretion.” Clin J Am Soc Nephrol. 2008 Sep; 3(5): 1453–1460. Traxer O, et al. “Effect of ascorbic acid consumption on urinary stone risk factors.” J Urol. 2003 Aug;170(2 Pt 1):397-401. Turroni S, et al. “Oxalate-Degrading Activity in Bifidobacterium animalis subsp. lactis: Impact of Acidic Conditions on the Transcriptional Levels of the Oxalyl Coenzyme A (CoA) Decarboxylase and Formyl-CoA Transferase Genes.” Applied and Environmental Microbiology. 2010;76(16):5609-5620. The beginning of your article is well thought out. But I started when you mentioned green tea. Green tea has been tested and it is low oxalate. For many people this DOES happen – for them- ‘automatically’ means ‘within a few hours.’ That is what happens with me, for example. If I eat french fries, within about two hours, I am intense pain in almost all my joints, and this pain lasts for the next four to five days. I totally agree with Annie. For me the oxalates make crystals in my urine that feel like knives cutting into my bladder. 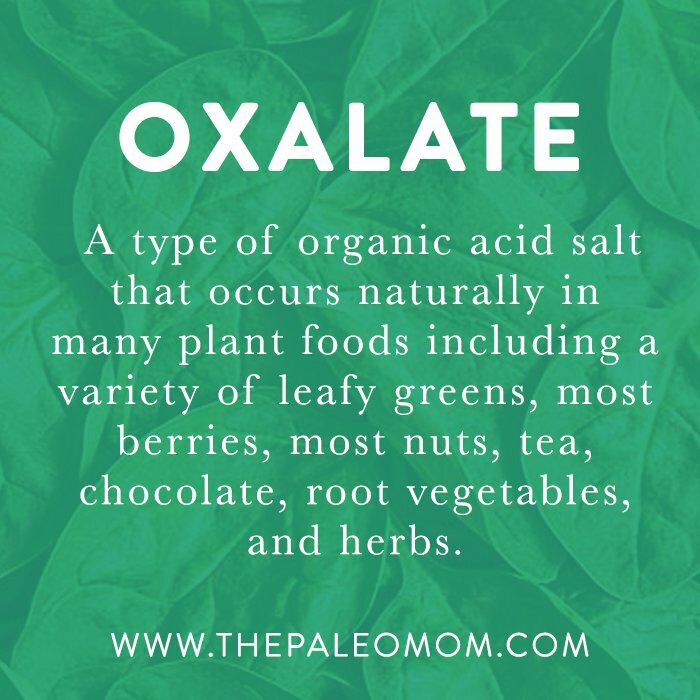 I know I’ve had too many oxalates when I start loosing bladder control and if I continue to eat lots of oxalates it begins to hurt when I urinate and I start having to go all the time. I wonder how many cases of interstitial cystitis and reoccurring UTIs are because of oxalates. In the low oxalate group that I belong to – almost everyone has been to a doctor, who diagnosed them with this condition. Your comment is quite misleading to the general public. What’s the best source of O. formigenes? I was looking for a supplement containing it some time ago, but couldn’t find one. Many thanks in advance if someone knows the answer. Great article! Any thoughts on if oxalates could cause saliva stones? I have 11 saliva stones in my left parotid cheek gland which I’m pretty sure are calcium oxalate like most kidney stones, no doctors have been able to tell me the cause as of yet (negative for sjogren’s syndrome) and the only solution is surgery once saliva flow gets blocked. It’s very frustrating because I really don’t want surgery and I have no idea what is causing them. I definitely used to eat a very high oxalate diet with very minimal calcium. Tons of vegetables, tea and a love of dark chocolate. I’m currently pregnant so I have been eating grass fed yogurt for more calcium, and my prenatal has K2 and D3 which I know helps with kidney stones (hopefully saliva stones too), previously I never ate dairy. Any thoughts or suggestions would be greatly appreciated, love all of your work and thank you! This is really interesting. I have researched oxalate levels for a condition I have called vulvodynia. There appears to be little research but some anecdotal evidence that reducing oxalates can help. If anyone has any insight here I would gratefully hear it! How about suggesting allergy testing versus assuming here? 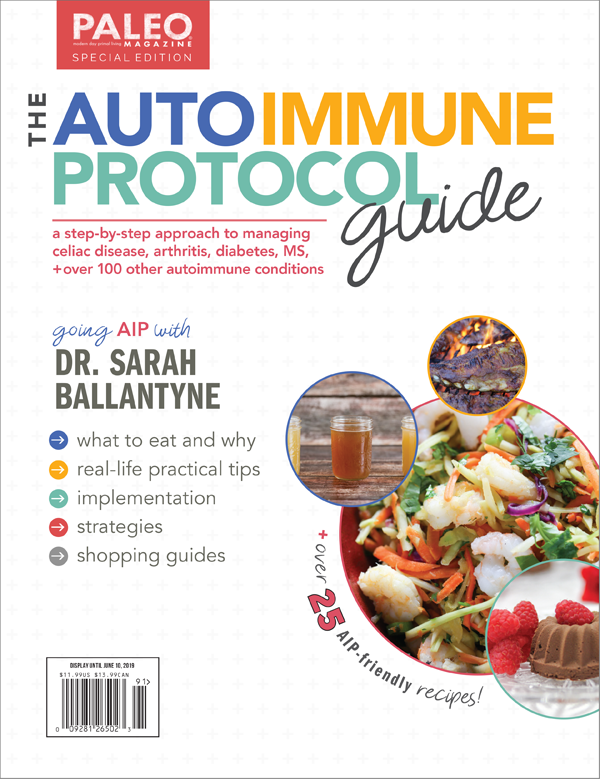 There are some autoimmune diseases that are very responsive to oxalate in the diet with almost immediate symptoms. Lichen sclerosis is one. Instead of guessing what foods you should/should not eliminate I would have suggested that diet be based on individual allergens. Generalizing is dangerous. Thank you for this post Sarah! 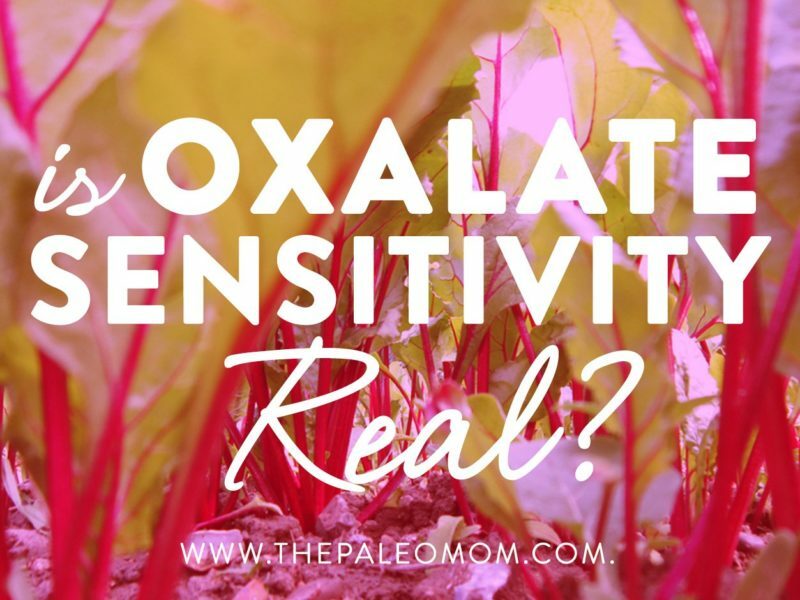 I’ve often wondered about oxalates, since I took the health coach training program at IIN, one of the teachers (the only nutritionist anywhere that I can think of) suggested that everyone has oxalate sensitivity and they should be avoided. 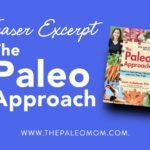 I eat copious quantities of oxalate rich foods pretty much every day, if I were to eliminate them, as well as all of the foods I’ve eliminated on AIP, I’d have almost nothing left to eat! I don’t have any history of kidney stones, and I’m always well hydrated, so I think I’ll just keep eating them because they’re all staples of my diet. I was looking into oxalates recently, and everything I read said that kale was low-oxalate, which I was relieved to find…because if spinach is out, kale is a pretty good option! For me, it isn’t about oxalate sensitivity, per se. It’s about multiple factors in my body that cause oxalate to leak into my blood stream, then to deposit in various areas of my body. 1) I have a genetic predisposition to having a B6 deficiency. B6 in optimal amounts is necessary as part of the body’s system of handling oxalates. 2) Due to many years of unrelenting stress ( marital abuse, bank rot you, parents with dementia) I have leaky gut. 3) Due to severe bacterial infections and many rounds of Uber potent antibiotics to kill the infections, it also very likely killed of all of my oxalobacter formigrnes. 4) Last but not least, I used to very frequently consume beets, carrots, nuts, chocolate, potatoes, spinach and other hig-oxalate foods. Add these all together, and you have “the perfect storm” for toxic oxalate accumulation in the body. 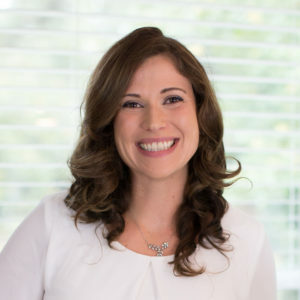 The oxalate has a particular affinity for buildup in the sites of old injuries like joints, muscles and connective tissues. For some reason unknown to me, it also builds up in my scalp, eyes, and thyroid. 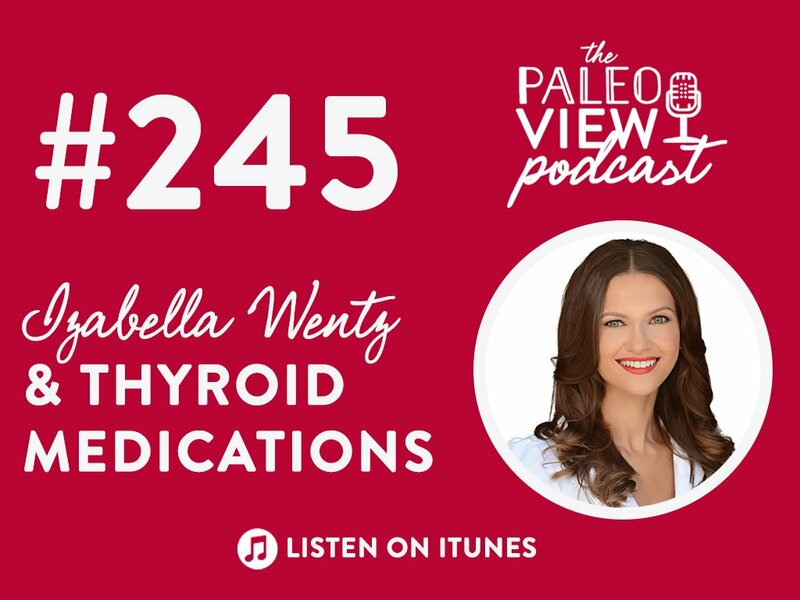 Simply being on a low oxalate diet for 6 months has reduced my most obvious hypothyroid symptom by about half. The excruciating pains in my hip joints and knee are gone. And scalp pain has diminished quite a bit. The hard part is that the low oxalate diet is restrictive. It’s so easy for me to slide back into olde eating patterns. Correction: that word was supposed to bankruptcy not bank rot you. Sorry about that.